Commercial customers can be allowed to use Purchase Order to afford for purchases with anterior authorization by referencing the PO number. This payment method is usually applied for wholesale orders. This time, we would like to guide you to set the configuration for Purchase Order payment method. Noting that before accepting payment by purchase order, you should set the credit worthiness of the commercial customer. On the Admin sidebar, click Stores > Settings > Configuration. In the panel on the left, choose Sales > Payment Methods > Purchase Order. In the Enabled field, pick “Yes” to activate Purchase Order Payment Method. In the Title field, enter a new title to change or leave the default of “Purchase Order” to recognize the Purchase Order Payment Method during checkout. In the New Order Status field, set “Pending” for new orders to wait until receipt of payment is authorized by admins. 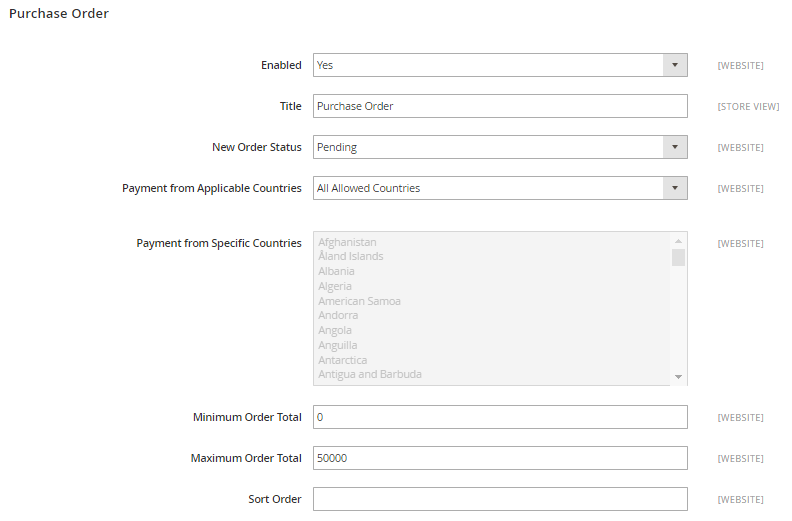 In the Payment from Applicable Countries field, choose “All Allowed Countries” to accept Purchase Order Payment Method for customers from all countries specified in your store configuration or “Specific Countries” to approved this payment method for some definite countries which you select from the Payment from Specific Countries list. In the Minimum Order Total and Maximum Order Total fields, set the order amounts required to qualify for this payment method. In the Sort Order field, enter a number to determine the position of Purchase Order Payment in the list of payment methods that is shown during checkout (start from 0). Click on Save Config button in the upper-right corner when you are done. If you are noticed to refresh the page cache, click the links in the notification, and follow the instructions. 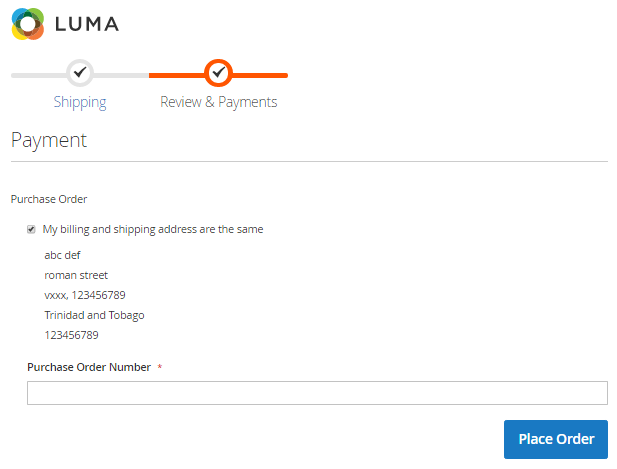 It comes to the end of the tutorial: How to Configure Purchase Order Payment Method in Magento 2.